At Baywood we pride ourselves on breeding quality Portuguese Water Dogs and Nova Scotia Duck Tolling Retrievers here in Edmonton, Alberta, Canada. Our dogs are not just show champions but working/performance dogs with great genetics behind them. 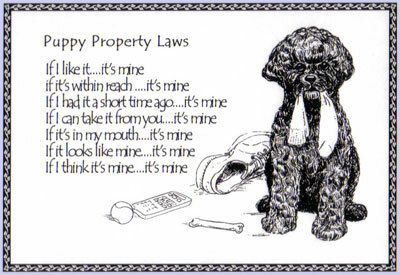 Because of this we have absolutely wonderful puppy owners. Our owners become part of our family when our puppies become part of theirs! Baywood owners can call or email us at anytime for anything. We encourage our responsible pet owners to get involved with activities that are fun for their family and dog. In the past we have organized fun water work classes, grooming seminars, and puppy get-togethers for all of our puppies and their new owners.